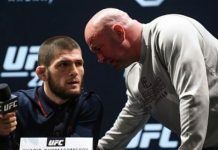 A lightweight title fight between undefeated Russian standout Khabib Nurmagomedov and streaking division contender Al Iaquinta served as the main event of tonight’s UFC 223 fight card in Brooklyn, New York. Round two begins and Iaquinta comes forward with a right hand that just misses the mark. 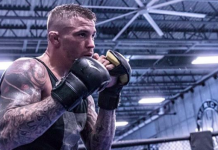 He backs Khabib up and throws a combination. Al is keeping a very low posture. Still, Khabib shoots in and drags him to the floor. Al has his head pressed against the cage. Khabib works some left hands but Al scrambles and gets back to his feet. Khabib looks to take his back and sinks in a hook. Khabib takes Al’s back and looks for a rear-naked choke. 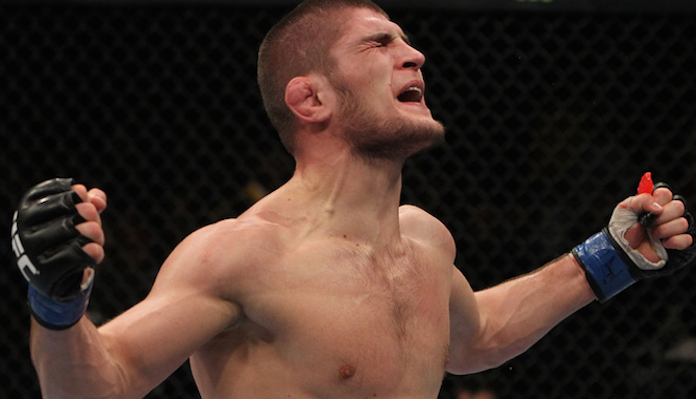 Iaquinta scrambles but he is now mounted by Khabib. Nurmagomedov flattens him out. Iaquinta attempts to his escape but he is all sorts of trouble. One minute remains. Iaquinta once again gives up his back. Khabib continues to work some big shots while attempting to secure a rear-naked choke. Round two comes to an end. Round three begins and Khabib lands a right hand to start. Iaquinta comes forward with a combination that misses. Khabib with a low kick. He has his hands very low. Another good kick from Khabib. He lands a pair of jabs. Iaquinta with a nice counter left. Khabib shoots in but his attempt is stuffed. Iaquinta lands a nice punch and then another. Khabib counters with a jab followed by a low kick. Al is bleeding badly now. Both men trade low kicks from the pocket. Iaquinta with a straight punch that lands flush. 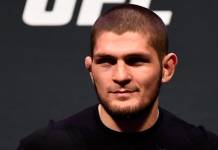 Khabib smiles. Another nice punch from Iaquinta. He lands a stiff jab. Khabib counters with a left hand followed by a low kick. The undefeated Russian has not attempted a takedown for a while now. Iaquinta with a nice jab and round three comes to an end. Round four begins and Iaquinta lands a jab to the body. Khabib scores with a left jab. A big right hand from Khabib lands over the top. He follows up with an uppercut and a low kick. Both men land jabs. Khabib with another jab straight down the pipe. More jabs from Khabib, he shoots in for a takedown but Al stuffs it. That is three takedowns in a row stuffed from Iaquinta. Two minutes remain in the round. 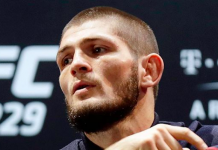 More jabs from Khabib. He lands a right hand over the top. Iaquinta replies with one of his own. Al is bleeding badly but continues to press the action. Khabib with another combo and round four comes to ane end. 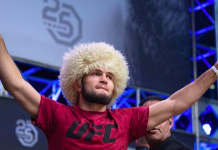 Round five begins and Khabib goes for a takedown but it is stuffed. Khabib lands a jab but Al counters with a right. Al with a left hand followed by an uppercut. He lands another right hand. 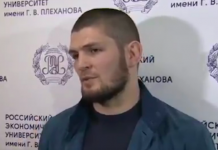 Khabib seems to be ok but he is not getting anything off. Nurmagomedov with a jab followed by a right. He pushes Al against he cage but cannot secure the takedown attempt. The Russian with some big punches and now shoots in and scores a takedown. He immediately takes the back of Iauinta. He locks in both hooks and then sinks in a rear-naked choke. Iaquinta escapes the submission attempt so Khabib decides to rain down punches. He continues to batter Iaquinta here. Round five comes to an end.